One of the posters displayed by Mthwakazi Republic Party activists. Mthwakazi Republic Party (MRP) youth, who protested at the Zimbabwe International Trade Fair in Bulawayo while President Emmerson Mnangagwa was attending a church service saying he was part of the Gukurahundi massacres of the 1980s, were on Sunday allegedly beaten up by armed soldiers and police. “Mthwakazi Republic Party youths have been removed from the Brady Military Barracks (and taken) to Bulawayo Central Police Station, but they are badly injured. The police insist that they are detaining them and charging them with breach of peace. 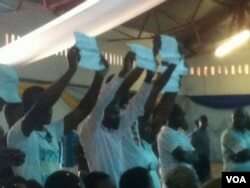 The 10 arrested members of the Mthwakazi Republic Party in action at the FOG church session at the ZITF in Bulawayo. The youth, who stormed the church session, claimed that Mnangagwa participated in the killing of more than 20,000 Zapu supporters in Matabeleland and Midlands provinces when then Prime Minister Robert Mugabe deployed the North-Korean trained Fifth Brigade to eliminate what he said were dissidents linked to Joshua Mqabuko Nkomo. The two provinces were Zapu strongholds. There was no immediate comment from the police. MRP claims that a well-known Zanu PF youth, Magura Charumbira, also participated in the beating up of their members. Charumbira is believed to have been one of the people who started booing former First Lady Grace Mugabe at White City Stadium recetly during a Presidential Youth Interface Rally when she started attacking then Vice President Emmerson Mnangagwa before he was sacked by former President Robert Mugabe. Charumbira was not available for comment.